With another quarter in the books, it’s time for a quarterly update on my investment portfolio, family spending, and blog stats. It’s the 11th quarter since I started this website, and I’m within 11 months of wrapping up what I believe will be my last “permanent” position in anesthesia. It was also the last quarter of part-time work before returning to full-time anesthesia for the rest of the year. With one of my colleagues departing for a military obligation, I agreed to step up my hours. After learning that he won’t be returning to us, we’re looking at bringing in temporary help while his replacement is identified. It’s likely I’ll be back to part-time work in January, and I’ll be looking to head south for a spell to escape the Minnesota winter. It’s early October, but it already feels like late fall — friends of mine a bit further north in the state have already seen trees downed in a snowstorm! Cash is building up as we prepare to build on our lakefront property next spring. We were hoping to get that project underway this fall, but the granters of permits had different ideas. I don’t include any of our properties (primary home, cabin, or the 7 acres on the water) in the retirement portfolio below. Also not included are two six-figure 529 Plans and $259,000 in donor advised funds. Only dollars that can be used to fund our retirement are listed below. I’ll be using screenshots from my universal portfolio tracker. You can grab a copy of the Excel sheet for yourself with a quick subscription. Download it and you’re free to unsubscribe at any time, including right away. My feelings will only be hurt a little. To avoid sharing my exact numbers, I divided the dollar amounts by a factor that would make it all add up to $1,000,000. The percentages are accurate, as is the fact that holding this portfolio costs me $657 per million dollars invested annually. Compare that to typical AUM fees plus higher expense ratios adding up to 1% to 2% which would be $10,000 to $20,000 per year per million dollars invested. Anticipating building a home without a construction loan, we’ve been stockpiling cash, leaving us temporarily, but intentionally, heavy on cash. In the spring, I intend to start spending that down, and when we eventually sell our current home, I’ll do some serious rebalancing with new cash. At that point, I’ll probably look more closely at additional crowdfunded real estate investment opportunities. I’ll also be investing more in international stocks, as those have taken a hit lately. On a percentage basis, about 56% of my investments are in after-tax accounts, including the non-qualified brokerege (a.k.a. taxable) account, cash, and brewery investments. Yes, breweries. 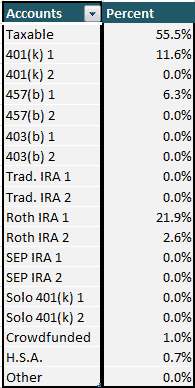 Tax-deferred investments are only 18% of the total, putting us in an excellent position for a low-tax retirement when I stop earning an income one day. Note that will not be next year, as I may be retired from medicine, but not exactly retired. Retired not retired. About 25% of the money exists in Roth accounts, and there’s a little bit in the HSA and crowdfunded opportunities. I also own a small piece of Passive Income MD, and I should really update that valuation as Dr. Kim is doing amazing things over there. It’s good to have a diversified portfolio, but this was one of those quarters where diversifying away from U.S. Stocks was not beneficial. Weak performance from a variety of other asset classes, including bonds, international stocks, and REITs were a drag on my returns in the third quarter of 2018. 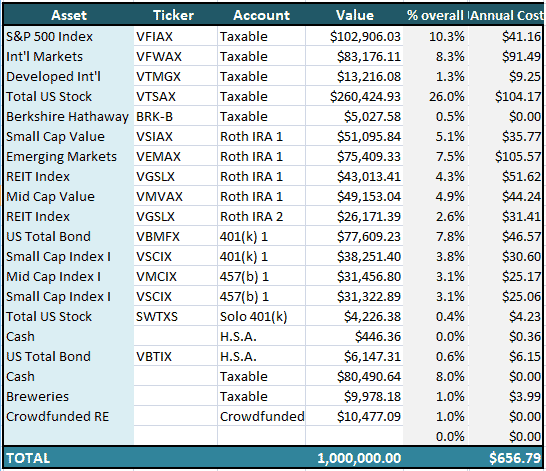 Overall, according to Personal Capital’s You Index, my returns were 3.7% whereas the S&P 500 returned 7.2%. Leading the pack, after a rough second quarter in which it lost 6.4%, was Berkshire Hathaway, returning 14.7% last quarter. From worst to first — while it is a stock with a large market cap and many holdings, it’s still a single stock and compared to index funds, it still acts like one. Bonds “smoothed the ride,” as they tend to do, and in a market where U.S. stocks are performing well, that means they keep my overall returns down, although they only represent a bit less than 10% of my portfolio. Vanguard’s Total Bond Fund lost 0.7% in the third quarter of 2018. Meanwhile, my cash sitting in Ally Bank is returning 1.9% (before tax). The biggest loser in my portfolio was emerging markets, but with a drop of 1.75%, it’s a loss I can easily stomach. The REIT fund was volatile like always, dipping into negative territory a few times and eking out a slightly positive return of 0.52%. Please don’t get used to this section. At the end of the calendar year, I plan to do away with it. There are a few reasons. First, I became financially independent without tracking spending or following a budget. I only started tracking it to prove to myself and my readers that I had truly achieved FI. Second, I’ve been tracking for a full three years now, and without trying, our spending has remained remarkably consistent. We spend between $60,000 and $70,000 a year. While I expect that to increase with inflation, and perhaps increase a bit more as we have more freedom to travel, our spending habits are pretty well ingrained. We’re not going to accidentally spend twice as much if we’re not paying attention. Finally, the tracking does take a little time and editing of categories (the stop at Hog’s Breath Saloon in Key West wasn’t “Personal Care” exactly) and it can create new headaches. For example, Mint.com struggled to keep up to date with Chase and several other accounts. Somehow, its futile attempts to log in would lock me out so that I couldn’t directly log in with Chase without calling and having a human manually unlock the account. I gave up on Mint. Now, I’m tracking with Personal Capital. It works nearly as well, although it doesn’t allow you to divide one expense into more than one category or allow for manual entry of cash expenses. It’s not perfect, but it’s good enough, and I’ll use it until this year is over. It looks like we spent about $18,000, but what’s not accounted for are reimbursements for tickets to a number of events. I didn’t win in the lottery for NCAA Men’s Basketball Final Four tickets — an expense that was included earlier this year — and I got my $900 back. I also sold a couple football tickets from last weekend when I was on call for $220 on StubHub. Back in July, I sold two of our Hamilton tickets via the same online broker for $550. We bought tickets for four to the Book of Mormon, but the friends we plan to go with will be paying us back for their two tickets. Factoring in that “reverse spending,” our actual expenses for the quarter were closer to $16,200. After spending about $33,500 in the first half of the year, we’re on target for an annual spend of about $66,000. Two years ago we spent $62,000, last year we spent $61,000, but now we’re paying an extra $5,000 or so in property taxes this year. See what I mean about consistency? Any money spent improving our lakefront property is tracked separately. We’re building equity as we do that and the costs will eventually be offset by selling one or both of our other properties. The second quarter saw three consecutive months of month-to-month declines in blog traffic? Would the terrible trend continue? Where’s everybody going? What did I do?!? Nothing wrong, apparently. We bounced back in a big way this quarter, topping 300,000 pageviews for the first time ever in August. 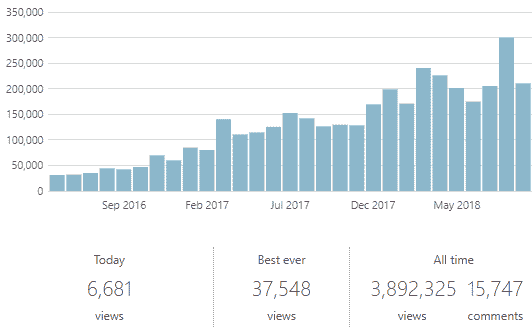 Later this week, we’ll have the two millionth pageview of the year and a couple weeks later, the four millionth pageview since the site’s inception in 2016. E-mail subscribers (become one today!) have already seen the rest of the data I’ll be sharing. They were also privy to site revenue information — a perk I reserve for those who receive emails when I publish new posts or my once-a-week weekly digest. As of 10.9.2018, the site has 494 published posts and 46 pages. These have been visited by people in 215 countries. Still no visitors from Greenland, North Korea, or a few nations in Africa. 709 Facebook Friends (under my FB pseudonym Milo Andersson) Friend me! If you’ve got any friends who may benefit from my content, please forward this e-mail on to them. The more people who hear the message of financial independence, the better. He Has Read Over 250 Investing Books. He Recommends These Three Funds and A Fifth Physician Revisited: The $10 Million Dream dropped out of the top 5. #2 is a Saturday Selection from PIMD that had amazing traffic over a few days, presumably thanks to Google’s content suggestion in new tabs in Chrome and on Android phones. I think physicians are searching online for how much they’ll need to retire, as #4 is also a new entry to the Top 5.
fatFIRE, which remains in the Top 5 for the 2nd consecutive quarter, is not a new concept, but I was among the first to feature it in a blog post, and definitely the first to start a Facebook Group around the fanciest flavor of FIRE. Next in line are The PoF Portfolio and Credit Cards for People Who Love Travel and Money. Doximity is #6 with 11,576 sessions, followed by Passive Income MD with 9,999. I fully expect that to be a five-figure number momentarily. My BI “Real Money” generated significant traffic, as did Google. I continue to get strong referrals from WCI and social media. WCI would very likely show up in the Top 2 or 3, but some must exist that keep me from seeing those clicks in the Jetpack Site Stats. Passive Income MD, the newest addition to the WCI Network rose from #2 for the first time. That’s one former marketer followed by two with medical degrees and two with legal degrees. Somehow, we all seem to get along. Most of the referred traffic from my site occurs via The Sunday Best. I’ve got guest posts lined up through the end of the year. We’ll see a Christopher Guest Post from a recent Plutus Award winner, a discussion of different charitable giving vehicles, learn about investing fraud, and hear how a physician retired early and was met with scorn. I plan to write about the somewhat marginal benefit of the “backdoor Roth,” my experience on a medical mission to Honduras, my first year of good-weather bicycle commuting, and I’m going to ask for your help in a fun charitable giving experiment just before Thanksgiving on 11/20. Don’t worry; it won’t cost you a thing, but you’re going to want to read that post first thing in the morning. Personally, I’ll be turning 43 next month, we’ll be celebrating the holidays, and we’ll close out the year with a family wedding on New Year’s Eve. It will be a busy but fun few months, and I’ll be ready for life to slow down as I return to my part-time schedule in 2019. Best wishes for a happy holiday season, victories for your football team when they’re not playing mine, and continued success in your quest for financial independence. Congratulations on all those milestones you achieved. Wow 300k pageviews in one month is just eye-popping numbers. Your growth from 2016 has been stratospheric and well deserved. I was thrilled when my site topped 4 digit pageviews in one month which would absolutely be dwarfed on that visual graph you provided. It definitely is a work in progress and hopefully my material can resonate with some and build a loyal audience like yours but doubt it could ever reach 6 figure pageviews/month. Very impressive feat you have achieved in a little over 2 yrs. I am not sure any blogger in the world has Greenland filled in on the map so I wonder if it is a Google thing that won’t register any users from there. My geographic map has been filling in and it still floors me some of the countries that have visited my blog. It is amazing truly what a global community we have and that the message we try to spread has reached such vast distances. Sounds like you have a busy 4th quarter ahead and early birthday wishes sent your way. One day, I’ll go to Greenland and click on all of our sites. Gotta field test this one. How do you get so many referrals from twitter? It’s a combination of having a good-sized following and being active on there. On new post days, I tweet about the post every 2 – 3 hours, typically. If 0.5% of my followers click on one of them, that’s over 500 views right there. Most days, it’s more like a couple hundred, but that’s how Twitter works. You’re too kind, Kristine. And I’m not saying we wouldn’t take you up on that. It was great cruising with you guys. Great summary PoF and congrats on the 300k visitors, that is really fantastic! I’m publishing my Q3 portfolio performance later this week as well and the international stocks have really been a drag. I took a look at my holdings over the past year or so and really consolidated. I sold my emerging markets and put it into my international fund. Similarly, I had a U.S. healthcare fund and an energy fund and sold those to fold into my Vanguard total market fund. I realized I really didn’t know whether those particular sectors would “pop” or not and it just added complexity to the managing and reallocating of funds. Have you thought about reducing the # of funds in your own portfolio to simplify things? What are your thoughts on this? It brought my overall expense ratio down a bit as well. I have been thinking that I will. The 457(b) will probably become all bonds — I plan to drain it over 5 to 10 years. I will probably roll my employer 401(k) into the solo 401(k) and I believe I’ll be OK continuing to hold Schwab’s total stock market fund there wihout worry of wash sales when tax loss harvesting. It follows a different index than Vanguard’s total stock market fund. I’ve got no good reason to hold both mid caps and small caps, so will probably consolidate to just small value for my US stocks in Roth. These moves will eliminate a handful of positions in several accounts. Makes sense. The longer I’m in the game, the more I want to simplify, simplify, simplify… It just makes everything easier. I’m in the same boat as you, Jon, and have recently concluded that selling off all the slice and dice will just make life easier with nothing else lost (other than some higher fees). I wrote about it here ), but the upshot is I’m converting to three funds. Boring wins again. As impressive as all that is, I bet you are just getting started! Just wait to see what happens after you don’t have the distraction of a stressful day job! I’m in awe of your growth and success! Thanks, WD. I’m impressed with your perseverance, productivity, and staying power. WCI gets credit as “the Godfather,” but you were blogging for 3 or 4 years before he came around. Wow, 494 published posts in that timeframe is super-impressive, especially conserving how long just about everything is. Nice job putting in the work to build something successful! When you put it that way, it really is a lot. At a pace of 4 per week, that adds up to over 200 per year. Like Pete McPherson says, you’ve got to Do The Work. Dude, are you an alien? You are unstoppable! Impressive what you have done in the last couple of years, both in terms of you blog & portfolio. Hat tip to you sir. Scandinavian. Rhymes with alien, kinda. Wow! Your all time page views basically equals the population of the city of Los Angeles. Maybe by the end of the year your page views will eclipse the population of the who state of Minnesota! Looks like I’ll have to get to about 5.6 Million to equal the great state of Minnesota — I imagine we’ll hit that number (all time) sometime next spring. The numbers seem big until I realize, on any given day, my worldwide readership could fit in one small town. Congratulations and well deserved. I guess this is the point where you no longer worry about traffic. What’s more impressive than those numbers is how you have been able to keep your budget relatively consistent over the years. And retired before 43 is the dream. I am glad you are enjoying with your family. Thanks for sharing your statistics and portfolio composition – very interesting stuff for a numbers and money nerd like me! One question… may I ask why your target cash position is 2%, down from 8% now? I’m just curious, as short term interest rates are now around 2.25% – not great but not 0% either. We haven’t talked about this, so maybe this is my ignorance, but for you, as someone looking to become early retired sooner rather than later, would a higher cash position make sense from a capital conservation/ lower volatility perspective? Yeah, Mint double counts some investments for me, too, and isn’t nearly as powerful for investments, so I never used it for that — only budget tracking. I was about to suggest my spreadsheet and I see you already came to the same conclusion. I would hope you continue to post expenses. As you retire or semi retire one thing you do is take back your risk that your employer now holds. and so your 3 years of tracking may change because owning your risk is expensive. Even if your portfolio continues to accumulate it will accumulate at a lower rate than during the W2 days. This is something important to demonstrate to FIRE people since FIRE seems to be almost entirely about the process of accumulation. My experience is deflation poses a different and more complicated set of problems. Some of that will show up in your expenses and how you manage that. May become the most useful thing you write about, because it seems least discussed in general. I’ll continue to monitor at a macro level, but I don’t plan on breaking it down to the dollar on a category by category basis. That’s what I did before I started tracking. I knew how much the monthly credit card bill was, and that’s where the vast majority of our spending was. I just don’t want to go through each line item as I do now, ensuring it’s the proper category and breaking it down in these updates as I’ve been doing. It’s a bit tedious. I don’t blame you not wanting to do that much detail. I never tracked expenses till I retired but now I find it quite useful. I track to the penny but could care less about categories. As you say I do monthly macros and can deep dive if I want. You get an idea of what months are expensive, what months are cheaper. I only track 2 accounts a main credit card and a bank. The other cards are paid for by the bank and amount to a trivial monthly amount but are still accounted for so it’s easy to track something like health care or 6 months of car insurance which is all on my main card but I don’t care about amazon purchases which are scattered across accounts.